I accidentally found out that our colleague @jumper created the ImportPatcher tool. Do you think it can be useful in this case, given that _openssl.cp37-win32.pyd is in essence a DLL? File "C:\Temp\python-3.7.1\Lib\site-packages\cryptography\hazmat\bindings\openssl\binding.py", line 14, in <module> from cryptography.hazmat.bindings._openssl import ffi, lib ImportError: DLL load failed: The specified module could not be found. At this time I don't know exact what the problem is. I compile a updated version of HTTPSProxy under Python 3.4.4 to a little suite for XP (see my signature) and found that the package "cryptography v2.5" results in this error. So I step back to "cryptography v2.4.2" an it works OK. In my latest version of HTTPSProxy, I also found the misconduct of the cryptography module version 2.5 (Jan 22, 2019). Yesterday again updated the modules for Python 3.4.4, because the support should end in March 2019. From GitHub I downloaded the cryptography module version 2.5 from the developer side and created it again with the help of "GRMSDK Version 7.1", without success. A test for creating cryptography version 2.4.2 was positive. Just in this moment I was looking at this post https://github.com/pyca/cryptography/issues/4011#issuecomment-389711206. I think it is a problem with missing OpenSSL libraries which are not in the cryptography package. Under "cryptography\hazmat\bindings" in the file "_openssl.pyd" I have no more errors after the exchange from the file from the version 2.4.2 under HTTPSProxy, maybe it helps narrow down the error. I dare to offer you the results of my experiments. I just built an empty bcrypt.dll and the error disappeared. However, I have no ideas about replacing missing functions with XP-compatible ones. Can you advise something? This is my first such experience. Sorry if something is wrong. But "cryptography-2.5" modules seem to come only in binaries. line 65 to 77 is built, using BCryptGenRandom. Otherwise, the block from 79 to 115 is built, using CryptAcquireContextW and other functions. Rebuilding OpenSSL should fix that problem but unfortunately, OpenSSL seems to use a horrid build system written in Perl and that makes it not so easy. In a perfect world, it would simply use CMake but we're not in a perfect world. By the way, what happens if add the XP-compatible code to the BCryptGenRandom function in the empty bcrypt.dll that I built? I'm not sure but It may work. BCryptGenRandom calls RtlGenRandom (aka SystemFunction036) as implemented by the KernelEx project. 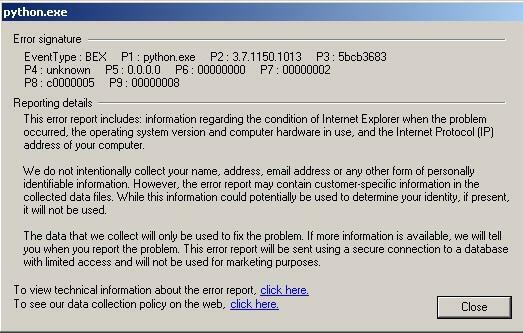 I once tested your "BCrypt.dll" on Windows XP with the module "cryptography-2.5" in Python 3.4.4 and HTTPSProxy started with no errors, but crashed on a connection (just closed). But still have HTTPSProxy compiled under Windows XP and tested under Windows 7 where it worked flawlessly. Definitely there is a problem in Windows XP where the system file "BCrypt.dll" does not exist. I assume that here in addition some functions in the "BCrypt.dll" are needed. Thank you for your effort. A check of the files of Crptography 2.5 (_constant_time.pyd, _openssl.pyd and _padding.pyd) with Dependency Walker shows many red functions in the various system files under Windows XP, which is not the case with Crptography 2.4.2. The library "BCrypt.dll" is only part of the many problems.